Donna's Crafty Place: Thank You! I made this card for this weeks Play Date Cafe Challenge. Below is the inspiration photo and colors. I used several different stamp sets on this card. Thanks for taking a look! So much color-saturated goodness here, Donna! You've used our colors this week so beautifully. Thanks for playing with us at The Play Date Cafe. Fabulous design, Donna! Love those medallions against the gingham background...simply lovely! Thanks for playing along with us at the Play Date Cafe! 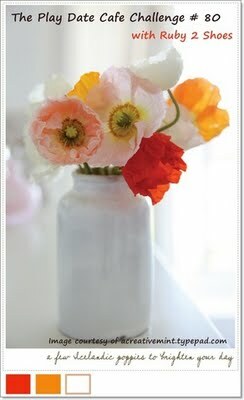 Gorgeous layering of the colors on your flowers! Love all that lacy goodness. Thanks for playing along at The Play Date Cafe.